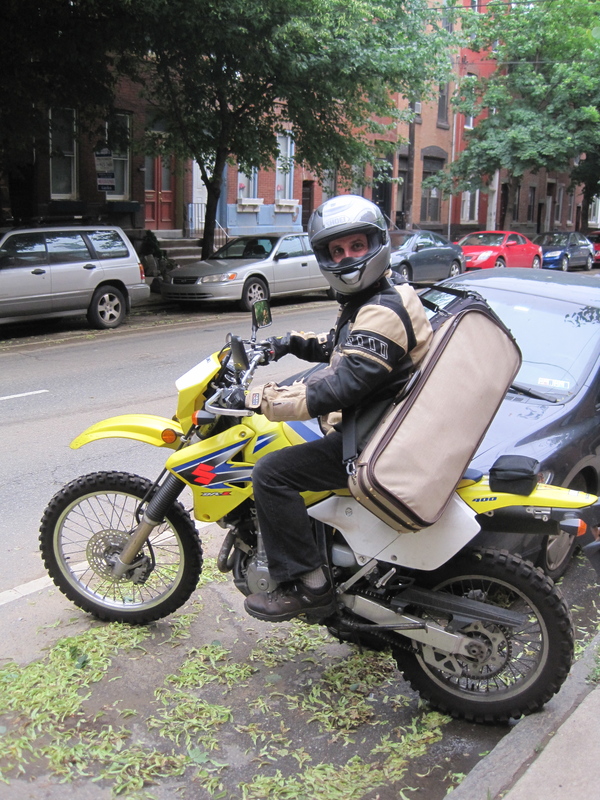 Not everyone shows up for a soundpost adjustment on a motorcycle carrying 2 violas!…especially members of the Philadelphia Orchestra – but David Nicastro does. 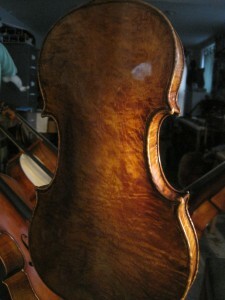 Its always a great journey working with a great player on a great instrument. 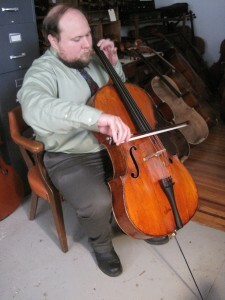 David plays a modern viola by Westerlund of Sweden and is considering a smaller viola by the same maker. 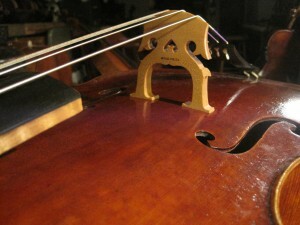 Getting the position and tension of the post just right to give the right balance of punch and warmth is often a matter of the tiniest movements – with the search ranging over just a few millimetres of surface area of post movement inside the instrument- great changes happen that often get an immediate response from the player…sadly, with demanding players its usually not ideal. 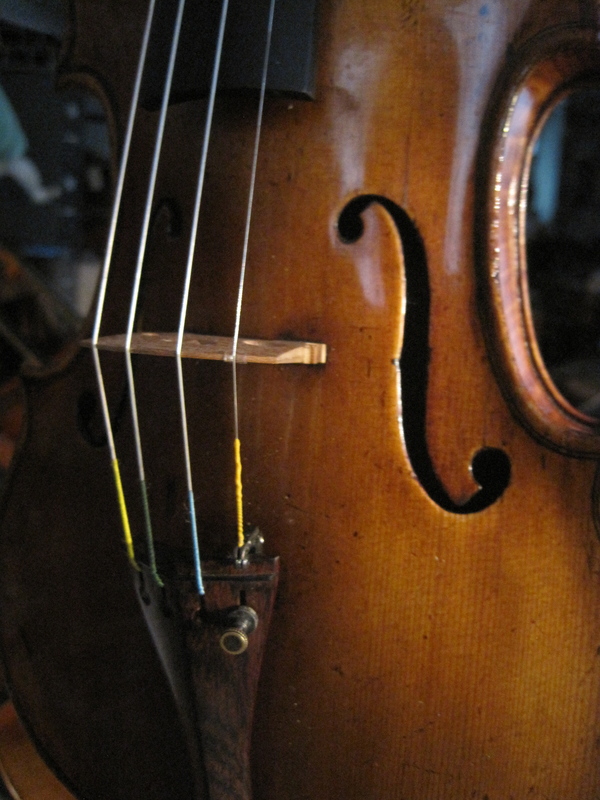 It all happened just in time for David to decide to take the newer,smaller one on the Orchestra’s tour to the Far East…..and he sped off into the distance with the viola slung over his shoulder. We get them unfinished and I work on them thoroughly inside and out …and lavish all the attention I would on a fine older instrument. 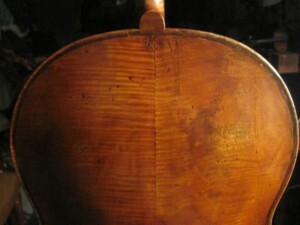 Pictured is a very nice Baroque cello that I brought along for the talented cellist from Brooklyn – Ismar Gomes. 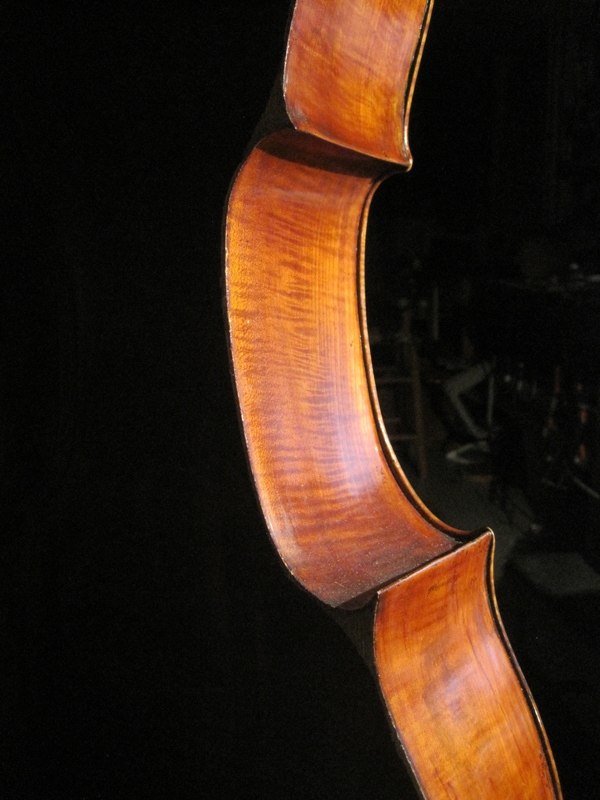 It was very interesting working with the lower tension aspect of Baroque instruments – lower neck angle – gut strings that come up to pitch at a lesser tension etc that change the needs of the instrument – i.e. 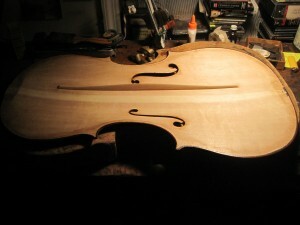 the cello needs a smaller bass bar – the top & back plates can be thinner to handle the lesser strain. 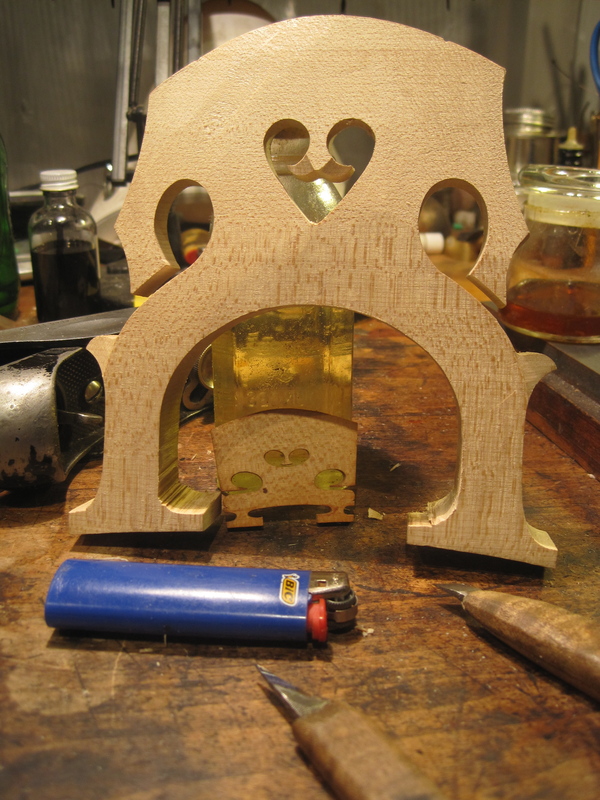 Also quite evident is the dramatically shorter fingerboard – and I had a great time cutting the Baroque bridge. 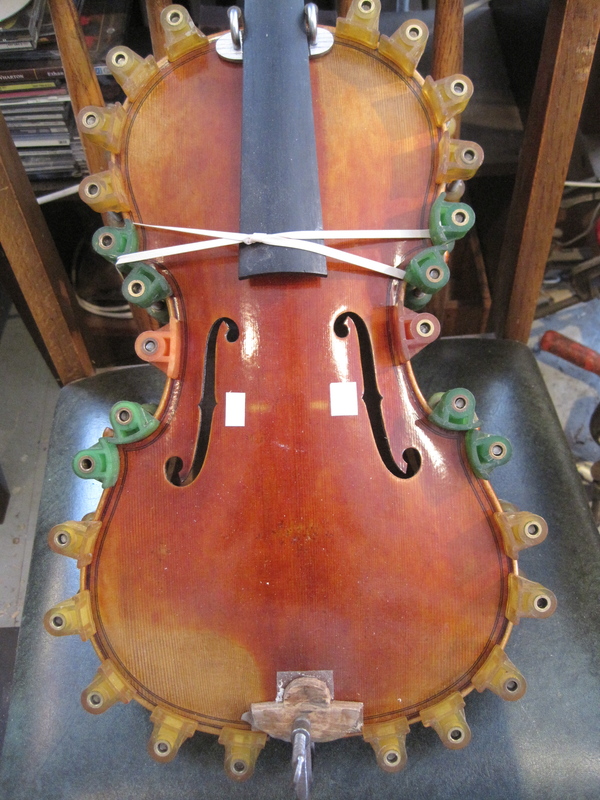 I have also helped many players to play on Haide violins- violas and cellos – pictured is the back of a very nice Guad copy violin….handsomely antiqued and a Maggini copy viola in clamps being closed up after working on the interior. 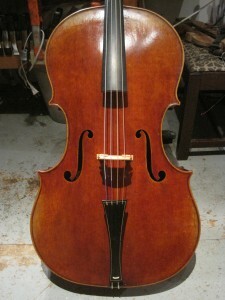 Also, recently I took apart Jeff Solow’s Montagnana cello ( that he acquired from someone else)to do all the work inside and out that I had done to cellos that I had sold to a few of his students – with great results – they really are fine instruments in this price range…..and with the right amount of energy and effort are truly capable of being special. This fine cello is played by Chris Gautier – who studied with Mr Cole at Curtis (knowing him all those years at Moennig’s …I could never call him “Landy”) and Aldo Parisot at Yale. 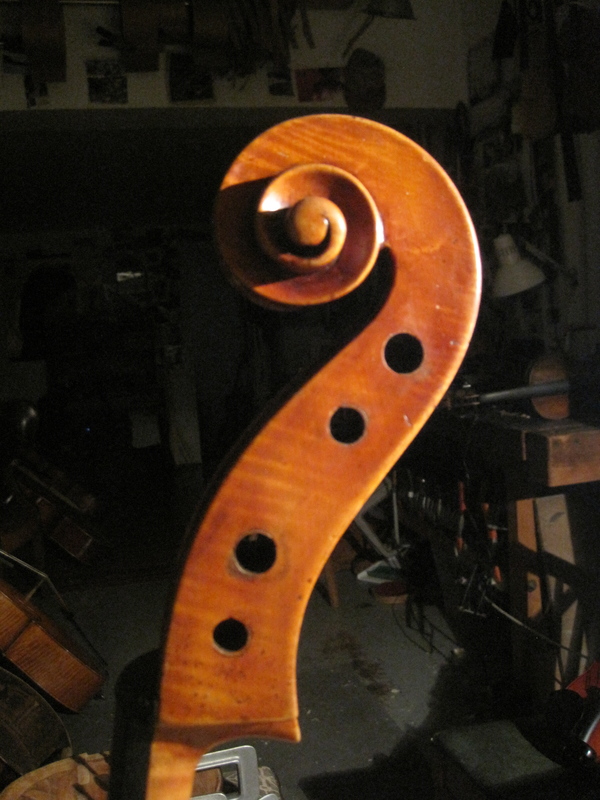 When I first saw the cello it wasn’t sounding at its best and it had sunk a bit at the bass bar due to a skimpy bar and an old crack there that had weakened the area. 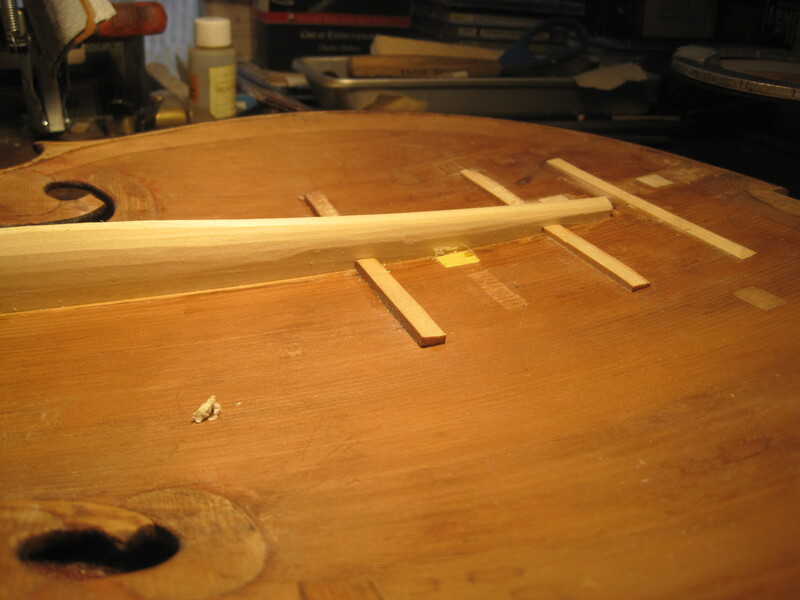 It also needed a higher neck angle – one that would allow a Belgian bridge for more punch and power to the sound. I removed the top – removed the old bar and fit some long studs with “spring” that pushed up the top to the correct arching ( this is a quicker and less costly way than making a cast – correcting the cast and then pressing the top into a corrected cast to restore the arching) These studs need to go under the bar – with the bar being fit over top of them. 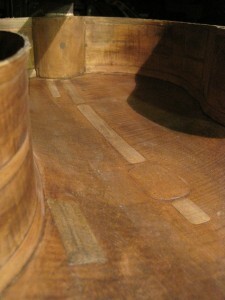 The photo shows the studs glued in and in the process of being shaped. Notice the interior shot with the filled nail hole on the original top block – there was a nail going through the top block into the neck stock for strength when the cello was made – this cello has had a neck graft and has been reset into the top block – the nail has been removed and the hole filled. Pictured here is the finished breast patch that has been fit to the top to support the corrected arching. This cello ( like many very old cellos) had sunk in the bridge area due to the immense strain of string tension over time – and in this case, a loose fitting post that did not provide support to the treble bridge foot. 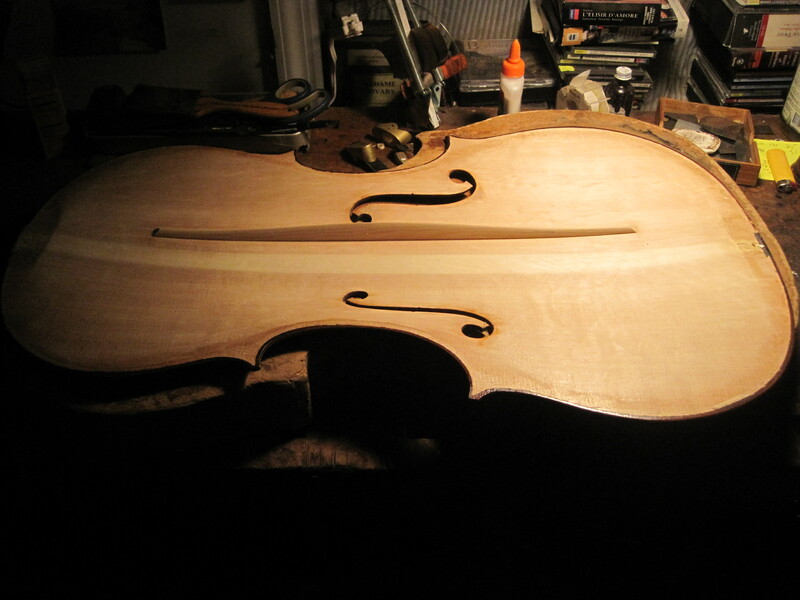 The hardest part of the process is the fitting -with chalk as a transfer- this size of a patch where the surfaces have to fit perfectly – otherwise the heft of the unworked patch will distort the delicate arched spruce of the top. Many books on tap e go by during this process. This beautiful violin is played by Dara Morales in the orchestra. Its a fine example by 18th century master from Mantua Tommaso Balestrieri that was played for many years in the section by Mr Lanza who bequethed it to the Orchestra upon his death. 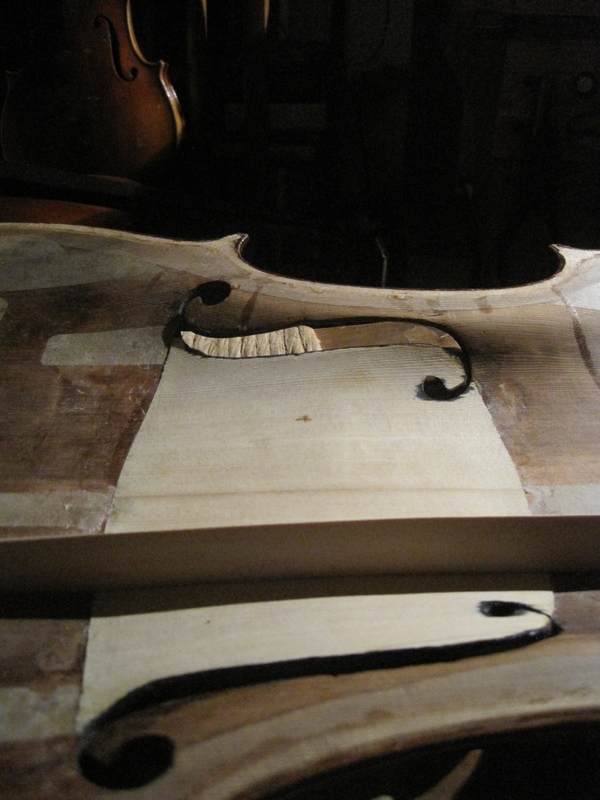 Balestrieri is a fascinating maker who continues a Cremona tradition that started in Mantua when Pietro Guarneri arrived there in the late 17th century. Pietro brought with him brought with him a spark from the sacred fire of Cremona and passed it on in a way that is seen for generations. 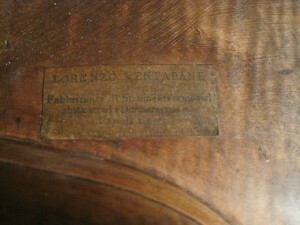 Balestrieri shows many aspects of Cremona workmanship and places the town’s name on his labels , though there is no evidence that he ever actually worked there. The scroll is a particularly distinctive feature with the large eye and long final turn. 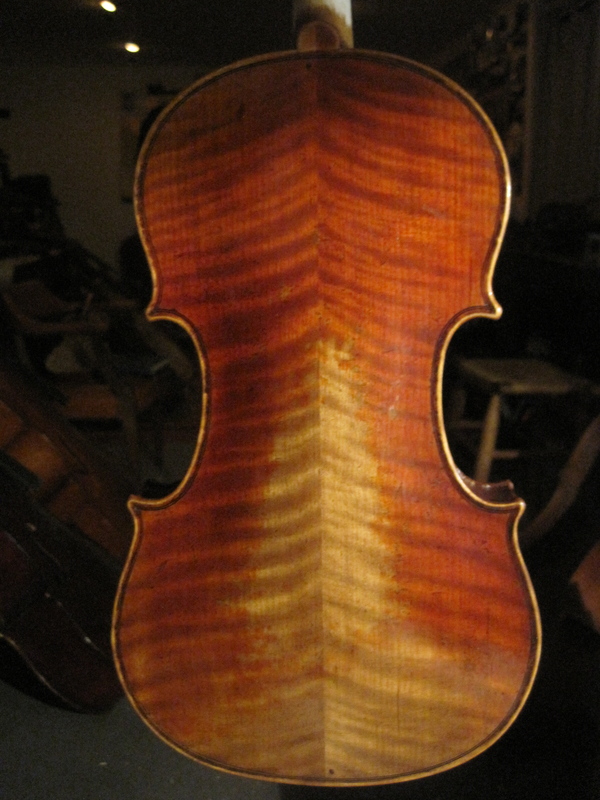 The back of this violin is rather petite at 35 cm – but wows you with its one-piece, dramatic, slab cut wood. 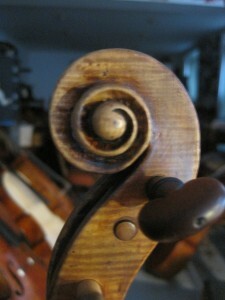 My efforts on the instrument were varnish restoration, gluings and bridge adjustment to keep it at its best. 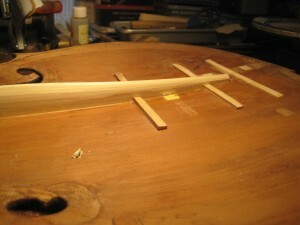 I don’t go out and look for Bass work ….but when it comes my way I try to “man up”. This is a bass bridge ( along with other work on this student bass) I cut for the great program “Play on Philly”. If you haven’t heard of POP they are a great new organization dedicated to getting the kids of Philly playing music in the “El Sistema” model from Venezuela. Bringing kids together in orchestras and many other wonderful musical activities is their mission – and they do it well. 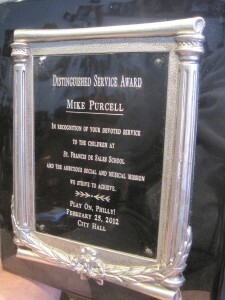 It was started by a few Curtis grads – Stan Thompson and his friend Mary Yong ( a friend and violist from Curtis)- and an old friend of mine Victoria Hurt ( maiden name) – cellist from Curtis. 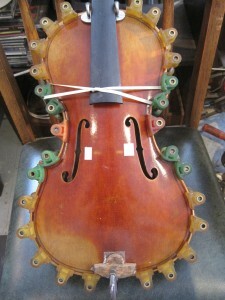 They appraoched me early about fixing up instruments that had been donated…..I hesitated when Stan asked if he could come by with 20 plus student instruments….then tentatively said yes…and that started the ongoing relationship. If you know of anyone interested in donating money to the cause of spreading musical opportunities out to the wider – and less affluent world for both musical and social benefit – I can think of no better way than to supp ort their mission. 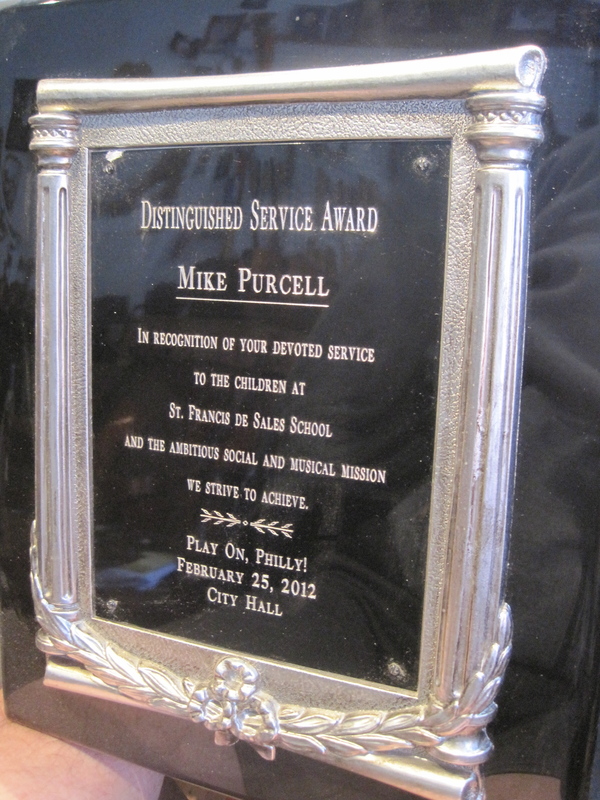 I even received a plaque from “Hizzoner” Michael Nutter! 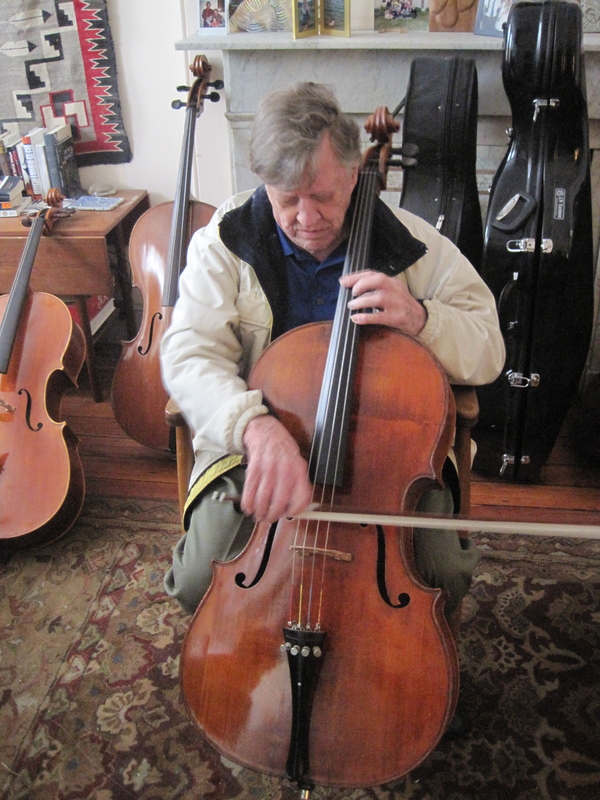 Mr Lorne Munroe comes to pick up his 2nd cello – made by Thomas Elmer in Phila 1962 – after some extensive repairs & adjustments. Its always a treat to see him , with his energy,his stories and his deep connection to history. His opinions are pointed – his charm is obvious- and his command of the cello is remarkable at his age. The Elmer cello is interesting… it has a rugged charm and a sense of genuine personality.He was a cellist that Mr Munroe knew who began to make instruments in his spare time. Among Mr Munroe’s vivid recollections – the one that stands out to me is the image of him working on arching the cellos in his rather small apartment, Mr Munroe mentioned visiting him once and he was arching a back over the bath tub as a way to collect and control the flying wood chips. 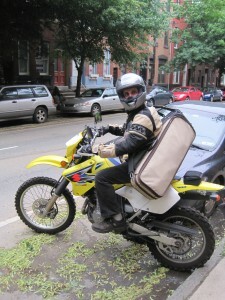 A priceless glimpse into how life and work were really lived.